KATHMANDU, May 16: The Election Commission (EC) has re-scheduled polls in various polling centers after failing to conduct the elections there on May 14. Elections in various polling centers were cancelled after some candidates died before the elections. 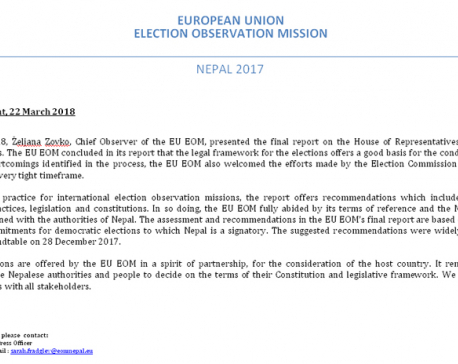 According to EC spokesman Surya Prasad Sharma, the elections have been re-scheduled in Ward No 11 of Kalika Municipality, Chitwan, Kumakh Rural Municipality, Salyan and Ward No 12 of Dhulikhel for Tuesday. Similarly, the EC has set Friday as the date for polls in Ward No 3 of Kharpunath Rural Municipality, Humla, after a UML candidate died of pneumonia before the elections.